When the recession hits a buttoned-up Los Angeles architect named Richard Best, what sensible path does he follow? He goes on a reality show. Hear his amazing-but-true experience on the Gulf World's version of The Apprentice. Plus, hear from Scott Neustadter, co-writer of (500) Days of Summer, about the movie's love affair with LA architecture, and from James Harris, who tells us the secret history of the 100-year-old Santa Monica Pier. 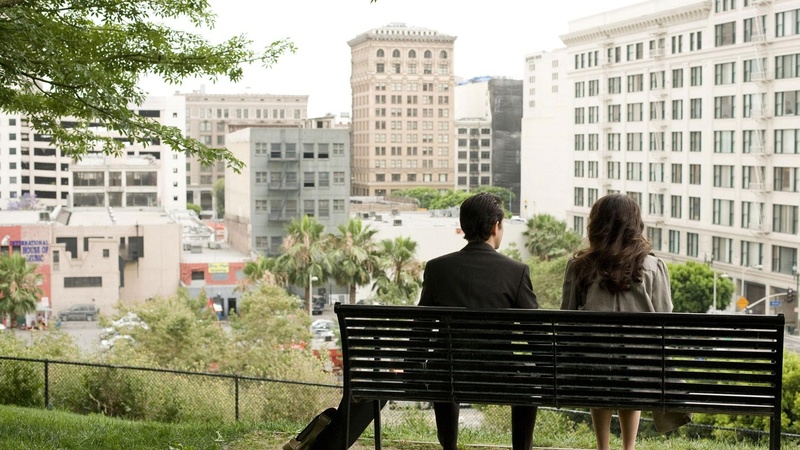 Screenwriter Scott Neustadter talks about the role that architecture plays in the new film (500) Days of Summer, starring Zooey Deschanel as Summer and Joseph Gordon-Levitt as Tom. Many historic buildings located in downtown Los Angeles are featured in the film, like the Dorothy Chandler Pavilion, the Fine Arts Building, the Continental Building, California Plaza and Angel's Knoll Park, the home of Angels Flight. The Bradbury Building (above), designed by George H. Wyman, and one of Tom's favorite buildings, has starred in many films, including Blade Runner. Many of the buildings can be seen on one of the LA Conservancy's walking tours, which are both docent-led and self-guided. Read more about the film's love affair with LA in Christopher Hawthorne's story in the newly-redesigned Los Angeles Times. Architect Richard Best's career took an amazing turn when he auditioned for The Hydra Executives, a real estate reality show that brought eight American and eight British candidates to Abu Dhabi in the United Arab Emirates to compete for $1,000,000 in funding for a new business venture. You can watch many clips from the show online, but our favorite is Richard's kandora-wearing outing (above) in Episode 12. Happy 100th Birthday, Santa Monica Pier! Author of Santa Monica Pier: A Century of the Last Great Pleasure Pier and pier historian James Harris takes us on a historical tour of the Santa Monica Pier, which celebrates its centennial this summer. On September 9, a centennial celebration will feature a 100-foot cake cut by Robert Redford and Joan Baez, fireworks, and three barges in the bay.